celebration | An adventure with food. It’s ironic that when I typed in ‘Hummingbird Bakery Marshmallow Cupcakes’ into Google, I got flooded with adverts for diet websites, slimming pills and that one secret for a flat tummy shared by thousands of women all over the world. If you’re still wondering what that secret is, apparently it’s a shed load of spam and a computer virus. My message is: don’t feel guilty for indulging in these once in a while, but when you’re unhappy because you look like a marshmallow, that’s probably the time to to eat a salad. Or sign up to the diet website. Up to you. Also please note that due to the recent appearance of measuring cups in my kitchen (source: unknown) that measure out real American cups, my repertoire of recipes has reached previously impossible (ok, a tad trickier than usual) horizons. I will try and include conversions wherever the recipe has them, or even post a nice little bit about converting cups to weights. Who knows. Recipe courtesy of Hummingbird Bakery, etc etc. Now eat. Preheat the oven to 170°C. Mix the flour, sugar, baking powder, salt and butter in a large bowl using an electric mixer or whisk. Do not worry if the mixture looks a little dry and crumbly: this is normal. Gradually add half of the milk and beat until just incorporated. Mix the remaining milk, egg and vanilla together and add to the dry mixture in batches, beating gently as you do. Be careful not to over-mix and cause the mixture to separate. Stop mixing if you feel this is happening – it begins to look like a very watery, scrambled egg. Spoon the mixture into cases in a deep muffin tray. Bake for 20-25 mins or until a skewer comes out clean. Standard rules apply. Leave to cool slightly before starting the icing. Melt one batch of marshmallows in a bowl over simmering water. 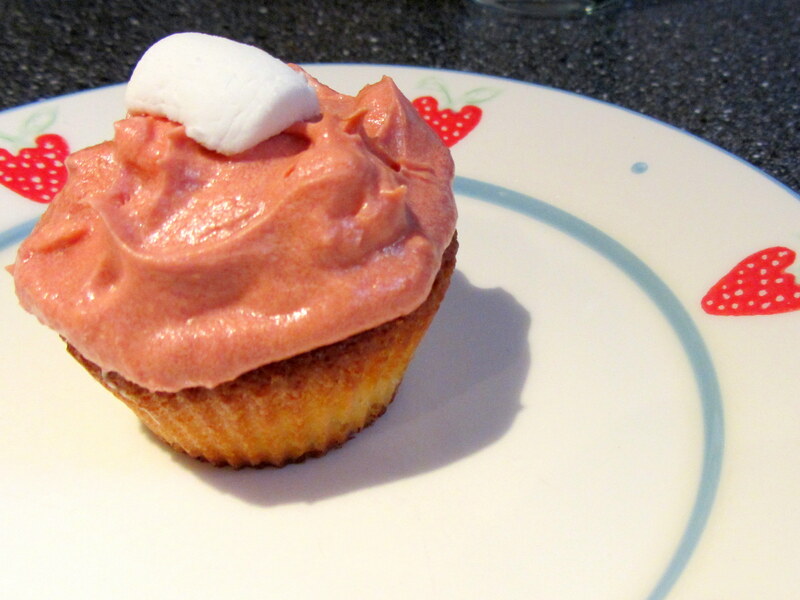 Hollow out a small section of the centre of each cupcake and fill with a dollop of melted marshmallow. To make the frosting, beat sugar and butter together in a bowl with an electric whisk. Add the flavourings to the milk and add the mixture to the mix whilst gently whisking. Once incorporated, whisk vigorously for five minutes until light and fluffy. Stir in the marshmallows. When the cupcakes are cooled, spoon the frosting on top and enjoy*!